Welfare Department Staff Nurse recruitment will be held through the Chhattisgarh Vyapam web site from 15-12-2017 to 08-01-2018. Only online applications are accepted for this Staff Nurse Recruitment. 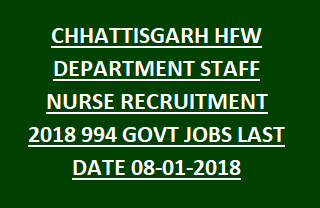 For more details regarding this Chhattisgarh Health and Family Welfare Department Staff Nurse recruitment 2018 please see below given information. Click here to see the official notification of Chhattisgarh Health and family welfare department Staff Nurse Recruitment 2017. Out of 994 vacancies 212 vacancies are reserved for the female candidate's. As on 01-01-2017 age limits for Staff Nurse CG Health and Family Welfare Department Recruitment is 18 to 35 years. Age relaxation 5 years for SC/ST, 3 years for BC candidates of Chhattisgarh and for Physical disability candidates upper age limit is 45 years. The candidate must have qualified B.Sc Nursing or Post Basic B.Sc Nursing or General Nursing/Auxiliary Nurse and Midwifery and must have registered in the Nursing Council. The selection for CG Staff Nurse will be held based on written test and personal interview. Examination fee details for this CG Vyapam Staff Nurse Recruitment 2018 will available on official website of Chhattisgarh vyavsayik mandal. Click here to apply online for Chhattisgarh Staff Nurse Recruitment 2018. The Eligible candidates can apply through online only via the official website of Chhattisgarh vyapam http://cgvyapam.choice.gov.in Before applying online you must read the user instructions and official advertisement of Staff Nurse CG Health and Family Welfare Department. Last date for online application is 08-01-2018. Please share this recruitment notification of Chhattisgarh Health and Family Welfare Department Staff Nurse Posts to your beloved friends through social media and help them to achieve the better jobs.